I don't know who puts these signs up and takes them down again (all the Mud Season signs are long gone!) 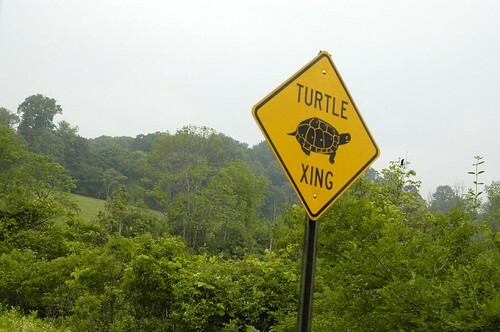 but it's a good idea - not just snappers but painted turtles are crossing in droves. 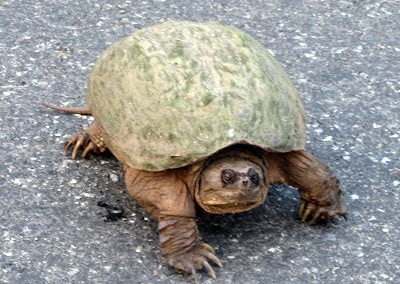 The snappers aren't as slow as they look, but they are MEAN. I tried to shoo one along and at first it started scooting across, then it stopped, sort of raised up on its legs, and then turned on me as if to attack. I fled back to the car and took a few more photos out the window - from a safe distance. It's blurry - maybe he scared me so much my hand was shaking! Yes, a nasty expression on his face. I didn't know turtles had expressions. I used to keep a shovel and a piece of cardboard in the back of the car to help snappers across the way.